Every e-commerce website deals with abandoned orders. There are many reasons that a potential customer trying to place an order may abandon their order. This is by no means a complete list, but it could be the shipping cost is higher than they expected it would be, their desired payment method is not accepted, or their payment method such as a credit card is declined because they entered something wrong. It could even be something as simple as the customer is distracted from the order process because they need to attend to something else at that very moment. Of course as an online merchant you want to avoid abandoned orders as best you can, but we all know they are going to happen. So what can be done to help in some way? SEO-Cart provides various tools to help both the customer and the merchant. 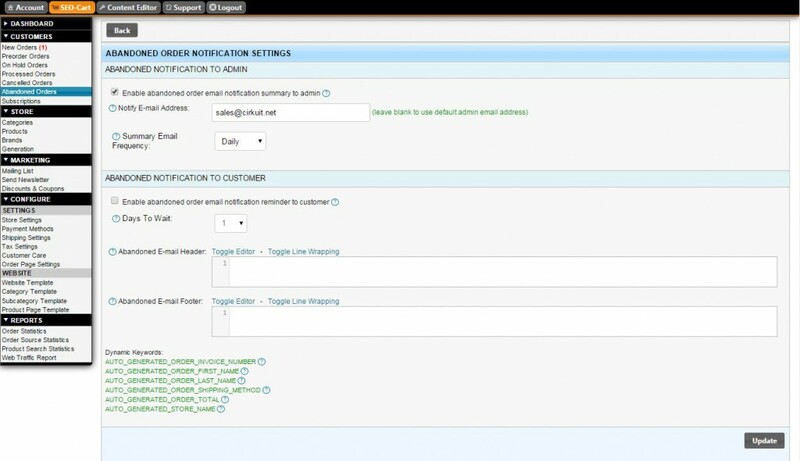 In the SEO-Cart BackOffice under the “Customers” management section is an option dedicated to “Abandoned Orders”. You can see any abandoned orders listed here for the month and by clicking on an individual abandoned order you can see the customer information entered, what they were trying to order, their payment method chosen, and what caused the order to be abandoned if related to a payment method failure. Additionally, under the abandoned order “Notification” settings you can set SEO-Cart to notify the merchant via email when an order is abandoned giving the merchant the option to personally follow up with the customer if so desired. Customers like this personal touch when they are experiencing a problem placing an online order. There is also an option to email the customer a reminder after an order has been abandoned. This email will include a button for the customer to return to their shopping cart on the website. The email sent conforms to the CAN-SPAM guidelines. Customers that abandon an order will also be automatically added to your mailing list under the Abandoned Order signup type group so you can keep in touch with them on any newsletters or promotional emails you send out. In closing, there is no doubt that abandoned orders are frustrating for both the customer and the merchant. With the tools provided in SEO-Cart the merchant will be aware of abandoned orders when they occur, and SEO-Cart can help in reaching out to those customers reminding them of the order they were trying to place, and giving them an opportunity to complete their order.